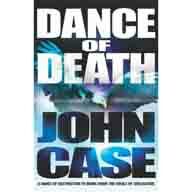 DANCE OF DEATH (or GHOST DANCER, depending on where you live) will do nothing to detract from the reputation of husband and wife writing team John Case for intensive research transmuted into gory thrills. For this book, the author had to study works about both Nikola Tesla and Native American lore to create the character of Jack Wilson, a Native American mathematical genius determined to avenge himself on the people who incarcerated him unjustly, and on western civilisation as a whole. Mike Burke was a freelance photographer but after receiving horrific injuries during the crash of a helicopter, he married the beautiful Irishwoman who rescued him and settled in Ireland with her to work in her father's firm. There he meets a man calling himself Francisco d'Anconia, a client who wishes Burke to set up a limited liability corporation. D'Anconia is the alias adopted by Jack Wilson, newly released from an American prison. Wilson is determined to build a device based on the work of genius Nikola Tesla, a machine capable of destroying western civilisation by means of resonance but in order to do so, he must raise funds to finance his work. Wilson allies himself with Islamic terrorists, cold-bloodedly slaughtering all whom he sees as hindering his progress (including his two bodyguards whom he actually likes). Wilson's business venture with Burke brings down the wrath of the FBI on the former photographer's head. He therefore sets out to trace d'Anconia in order to remedy the constraints placed on himself and the firm for which he works. As is customary in the work of John Case, the adventure wades through bloody atrocities and sallies into surreality as Wilson and Burke each strive to attain their goals by the summer solstice, the date Wilson has set for his ultimate vengeance. The author doesn't believe in pulling punches. The description of Burke after the helicopter crash is tummy-turning but even worse is the scene where a child is 'necklaced' -- incinerated after the ignition of a petrol-filled tyre placed around him. The authors had already convinced me that Wilson was completely devoid of humanity before he ever lit that match! Completely at odds with the sadistic cruelty he displays is the sentimentality in which Wilson indulges when he goes a-courting Irina, a Ukrainian woman. I thought her introduction into the tale ratcheted down the bathos rather than increasing the tension, although I could see she was necessary for the denouement. Nonetheless, surely the authors could have created a convincing character more in keeping with the rest of the story rather than someone whose invention gave me the impression of being an easy way out. While the tale might be considered just a bit over the top (oh, all right, a fair bit over the top) it is, nevertheless, a good fun read and one likely to enlighten readers on several topics, both cultural and scientific.